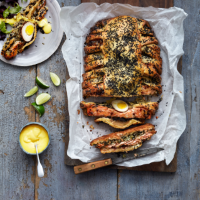 This Asian twist on salmon coulibiac makes quite a centrepiece. 1. To prepare the tea eggs, bring a small pan of water to the boil and gently lower in the eggs. Bring back to the boil and simmer for 5 minutes. Drain and refresh immediately with cold water, then peel and set aside. Put the remaining ingredients into the pan with 1.2 litres water. Bring to the boil, simmer gently for 20 minutes, then turn off the heat, add the peeled eggs, cover with a lid and leave to steep for a few hours or overnight. 2. To make the pastry, preheat the oven to 200˚C, gas mark 6. Pierce the potatoes all over and bake for about 1 hour, or until tender; set aside until cool enough to handle, then peel, pulling off the skin with a knife. Mash well with a fork and cool completely. 3. Sieve the flour into a bowl, add a pinch of salt, then rub in the butter until it resembles fine crumbs. Mix in the mashed potato (about 650g) and egg yolks to form a soft but firm dough. Wrap in cling film and leave to rest in the fridge. 4. Boil the rice in lightly salted water for about 20 minutes, or until tender. Drain, refresh under cold water, drain again and .set aside. Heat the oil in a small pan, add the salad onion, garlic and chilli and cook for a few minutes, until softened. Tip into a large bowl with the drained rice, coriander, nori and sesame seeds. Add the lemon juice and season. 5. On a piece of baking parchment (lightly dusted with flour, if needed), roll out the pastry to a 42cm square. Spread the rice mixture in a line down the centre, leaving a 15cm border on each vertical side and a 5cm gap at the top and bottom. For the sweet ginger butter, beat together all the ingredients and season. Spread the butter over the salmon and lay alternately with the eggs down the length of the rice. 6. Preheat the oven to 200˚C, gas mark 6. Cut a 7.5cm triangle from each corner of the pastry; set aside. Cut strips diagonally down each side of the pastry, at 2cm intervals, from the edge right up to the filling. Fold over each end of pastry, then bring each pastry strip up over the filling on both sides (it won’t meet the centre). Roll out the reserved pastry to make a 30cm x 5cm strip; lay this along the top of the pie. Brush with the egg white and sprinkle over the black sesame seeds. Bake for 40-50 minutes, or until crisp and golden. 7. For the hollandaise, melt the butter in a small pan on a low heat. Stir in the miso paste and remove from the heat. Whisk the egg yolks, yuzu juice and mirin together in a large heatproof bowl; set this over a large pan of barely simmering water. Whisk until creamy and light in colour. Gradually add the melted miso butter in a thin stream, whisking continuously until you have a thick, foamy sauce. Remove from the heat; season and keep warm. Slice the pie and serve with a drizzle of hollandaise and lime wedges, if liked.